Pairs Perfectly with Chocolate Espresso Sauce, Unforgettable 18-Year Balsamic Dulce de Leche and Coconut Balsamic Fresh Mango-Lime Curd. Whisk sugar, cinnamon and espresso grounds to just combine. Set aside. Create piping template. Use ruler and sharpie to measure and draw straight lines, 4 inches apart, across parchment paper. Turn parchment over to line sheet tray. Combine flour, cinnamon and orange zest in separate bowl. Set aside. Bring water, Blood Orange olive oil, brown sugar, and salt to a boil over medium high heat. Briefly remove pan from heat. Add flour mixture and return to burner. Continue to cook and stir continuously with wooden spoon over medium high heat until mixture has thickened and “dried.” Dough will come together in a slight ball and leave a thin film on bottom of pan. Beat hot dough on medium speed in stand mixer fitted with paddle attachment. Add eggs, one at a time, and allow to incorporate. Continue to beat just until dough is smooth and no longer steaming. Fill pastry bag fitted with star tip #866 (medium-sized star tip). Pipe straight, 4-inch long churros onto prepared parchment-lined sheet tray. Freeze. Allow churros to defrost prior to frying. Fill heavy pot with 4-6 inches of vegetable oil and heat to 375 degrees. Fry churros, five at a time, until deep brown, approximately 6 minutes, turning over to ensure even frying on all sides. Churros are ready when oil nearly stops bubbling. Remove churros with slotted spoon and allow to drain on paper towel-lined sheet tray. Toss in espresso cinnamon sugar to coat. Enjoy while they’re hot and dip them into a trio of Gustare sauces (recipe links above)! Note: Freshly mixed churro dough may be piped directly into fryer oil, but it is more difficult to control the size and shape of the finished product. Direct piping may also cause hot oil to splash dangerously. Instead, churro dough may be mixed, piped and stored in the freezer for several months, allowing easy prep for your favorite celebrations. Just pull and fry what you need when you need it! Tossing sugar may also be made ahead and re-used. 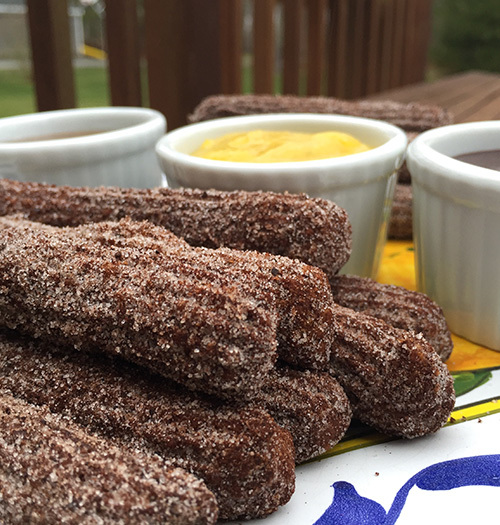 Churros should be enjoyed on the day they are fried (as if ANY of them would be left over anyway).